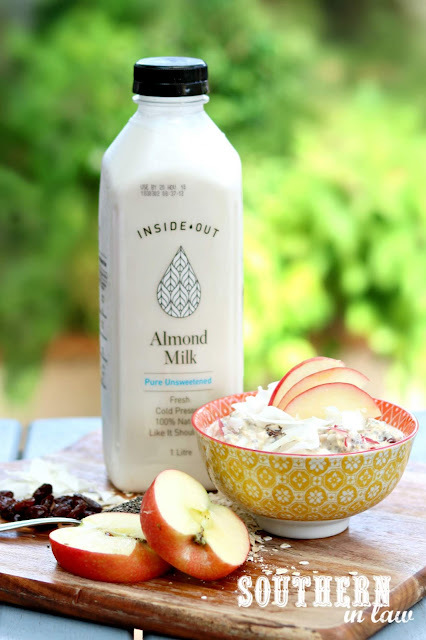 Thanks to Inside Out for sponsoring this recipe! When it comes to breakfast, I'm always looking for the easiest option that's also healthy and full of good stuff. And for me, easy means quick. That's why I LOVE make ahead breakfasts. Whether it's The Best Vegan Baked Oatmeal Recipe topped with nut butter and fresh fruit or this Vegan Bircher Muesli Recipe, I love having breakfast already made so that all I have to do in the morning is flick on the kettle, make some tea and grab my breakfast from the fridge. 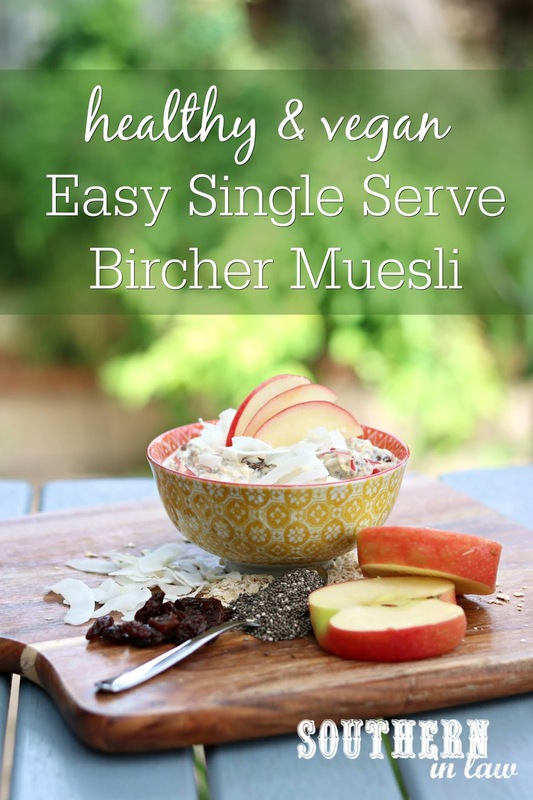 Usually bircher muesli recipes are made in huge batches so you have enough for the week - but sometimes you might just want it for a single breakfast - and that's where this recipe comes in handy. This single serve recipe can be made the night before (or a few hours before if you want it for lunch!) and is packed full of healthy ingredients and you can easily customise it to use your favourite mix ins or whatever you have home. Whilst this recipe is labelled as vegan, it doesn't have to be. I make mine with Inside Out Pure Unsweetened Almond Milk because I love the flavour (and it's 100% natural - no funky ingredients like other almond milks have) and i'll add regular greek yogurt to make it extra creamy. If you wanted it to be vegan, simply swap the greek yogurt for almond milk or non dairy yogurt and you're good to go! If you are gluten free and can tolerate gluten free oats (read more about that here) it can be gluten free too! makes one serving that's easily multiplied to serve more! Add all of your ingredients to a bowl or container and mix until combined. Cover with plastic wrap, beeswax wraps or a lid (if you use a container) and leave in the fridge for 1-2 hours or overnight to thicken up. When you're ready to eat, top with any additional toppings you like or enjoy as is! If it's too thick, you can thin it out with a little more almond milk, or if you want a creamier breakfast, add some extra yogurt. 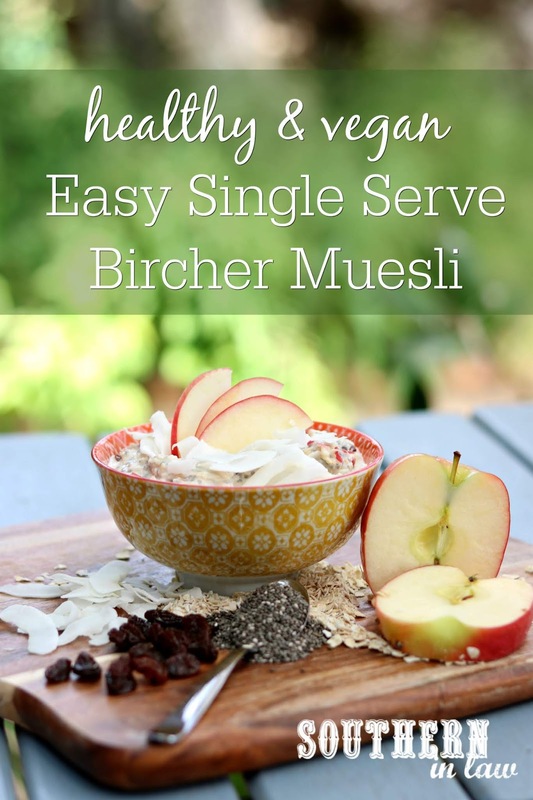 This bircher muesli will keep for 2-3 days in the fridge. *You can use rolled oats or quick/instant oats in this recipe. The instant oats will be softer but both options are delicious. If you can tolerate gluten free oats (read more about oats on a gluten free diet) you can use uncontaminated gluten free oats to make this recipe gluten free! **The lemon juice just stops the apple from browning. You can leave this out if you can't have lemon! Feel free to use whatever mix-ins you like. I like to use coconut, raisins and unsalted walnuts and almonds but you can use whatever you want! In the morning I like to top mine with extra coconut and fresh apple slices or fresh berries and a generous sprinkle (ahem, spoonful) or cinnamon. What have you been eating for breakfast lately?